With Apple being the world’s most valuable company, it’s hardly surprising that bootleggers dedicate their time and efforts to creating fake versions of its revered product range. The term knockoff has even been coined to describe these devices and their makers, and watching these attempts slip through the net and into the market has become something of a spectator sport. With the Cupertino company rumored to be plotting the ‘iPhone 5S’ for release in the near future, resident rip-off merchant Goophone has come through with its ‘i5S’ handset, and although we wouldn’t be tempted by a copycat device perhaps ourselves, it’s not hard to see how the company stays in business. 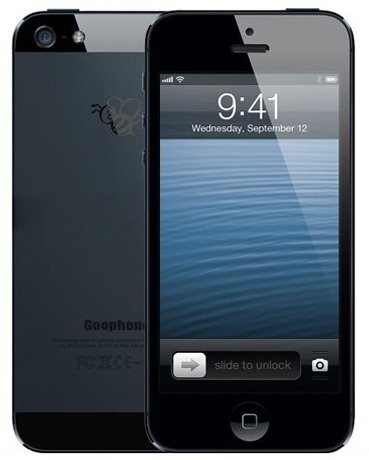 Goophone is one of the foremost iDevice knockoffers, and although the i5S obviously doesn’t run on iOS (only Apple’s own smartphones and tablets can run the mobile software), it does pack a fairly reasonable array of specs. In years passed, fake devices have been nowhere near the real deal in terms of power, storage, and build quality, and although the Goophone may still be bereft in those key areas, it’s certainly no pushover. Also, they were the ones who didn’t hesitate to knockoff the iPhone 5 as well. Although this device is said to be a knockoff of the unannounced iPhone 5S, it looks like, and is inferior to, an iPhone 5. Nevertheless, its dual-core 1GHz MediaTek processor, 512MB RAM, an 854 x 480 resolution display, and a 5-megapixel rear camera will certainly keep the job ticking over just nicely, and with Android Jelly Bean also thrown into the mixture, its $150 launch price tag seems like a snip. Forgetting even the fact this is an iPhone knockoff, it’s actually not a bad deal for a dual-core Jelly Bean handset. The iOS look you see in the image is little more than a theme, but while I would be able to spot the differences if I was actually holding the device, it certainly looks legitimate from here. Still, whilst the looks may be getting more realistic, the hardware is not quite as quickly out of the blocks. Mid-range at best, the Goophone i5S’s innards don’t reflect the device it purports to imitate, but at that kind of price, it will still maintain a decent consumer base on the black market.